Ed Martin has said what many in racing have long wished they could—Enough is enough. The president of Racing Commissioners International has asked New York racing regulators to review trainer Richard Dutrow Jr.’s license with the aim of revoking it. Racing regulators have sanctioned Dutrow at least 64 times for violations in nine different states at 15 different racetracks since 1979, according to Martin. Dutrow’s cavalier attitude doesn’t help. It wasn’t just his admission that he used anabolic steroids, then legal, on 2008 Kentucky Derby Presented by Yum! Brands and Preakness Stakes (both gr. I) winner Big Brown, but his flippancy that caused folks to cringe. Big Brown on steroids was among the troubling issues that caught the attention of Congress, which grilled racing leaders on the sport’s perceived problems after Eight Belles broke down after the 2008 Derby. Anabolic steroids subsequently were banned in most racing jurisdictions. Plenty of people in racing bemoan a system that allows certain trainers to rack up innumerable infractions, continue to do business while suspended, and then essentially receive a slap if found guilty. Granted, every citizen deserves due process, but in racing this right can take on ludicrous proportions. Martin’s call for action has resonated. 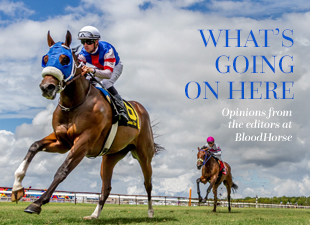 The board of the Thoroughbred Owners and Breeders Association is increasingly frustrated by penalties that “are not severe or significant enough to deter people. And when you get a slap on the wrist, for a lot of people it’s just the cost of doing business,” said Dan Metzger, the TOBA president. While Metzger and others agree medication policies and testing procedures have improved, the penalty phase needs to catch up. “There essentially has to be pain felt for the offenses,” Metzger said. Other sports impose clear-cut penalties for drug and other violations. In Major League Baseball a third positive for steroids results in a lifetime suspension. Same for the NHL. The NFL has an intervention program while also imposing stiff penalties on players who test positive for banned substances. A first offense earns a four-game suspension; a third offense, and the player sits out for 12 months. The NBA doesn’t cut much slack either. It recently handed Memphis Grizzlies guard O.J. Mayo a 10-game suspension even though he claims his positive resulted from an energy drink he bought at a gas station. How would Thoroughbred racing react if held to the standards demanded by the Federation Equestre International (FEI)? The organization has a zero-tolerance policy, and no one ever wins an appeal. At the 2008 Olympics five riders were disqualified, including American Courtney King-Dye, whose horse tested positive for a small amount of the anti-inflammatory felbinac, which is commonly used in China to relieve arthritis pain in humans. It is widely thought accidental contamination caused the positive. Nevertheless, King-Dye’s disqualification stood as she could not prove how the contamination occurred. Draconian maybe, but effective. Consider that no horse tested positive at the recent World Equestrian Games, conducted under the same FEI rules. As racing inches toward uniformity, the Racing Medication and Testing Consortium proposes rules that would impose greater penalties on repeat offenders. The consortium also wants to extend penalties to veterinarians and possibly owners. But executive director Dr. Scot Waterman cautions that regulators can’t just apply blanket penalties. “I think each violation is unique and is going to have a unique set of circumstances, and the penalty needs to fit those circumstances,” he said. Few would disagree that those who mockingly and regularly violate the rules of racing should receive the highest possible penalty.